Revlok Mezzanines is the only UK modular 'mezzanine flooring' supplier that has attained Local Authority Building Control (LABC) approval. With over 50 years experience in the engineering sector, we have the relevant expertise and skills to complete any mezzanine floor or 'storage platform' installation project. Based from our factory in Rochdale, Lancashire in the North West of England, Revlok design, manufacture and install all of our demountable and 'modular mezzanine floors'. All of our workforce are trained to the highest standard our attention to detail and quality control is second to none. We can offer CAD-based drawing for Building Regulations approval and can carry out our expert installations anywhere in the UK. Visit our website to see details of projects we have undertaken from initial concept to design and complete installation. Free site survey and no obligation quote available to all customers. 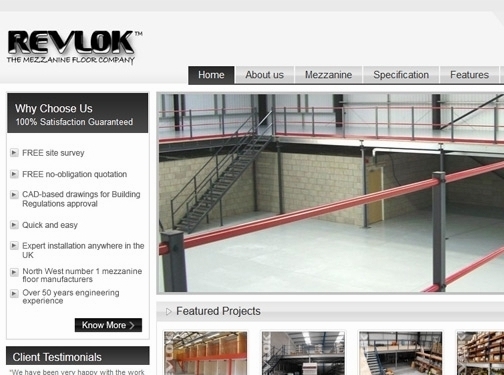 Revlok Mezzanines are the quick and easy choice to make. UK (Rochdale, Lancs) based business - with over 50 years' experience - providing mezzanine / storage platform design, manufacturing and installation services. Website includes details of services provided, accreditations gained, case studies (within "gallery"), work examples, associations, installation video, full contact details. Company website has been online since 2009 according to web.archive.org.